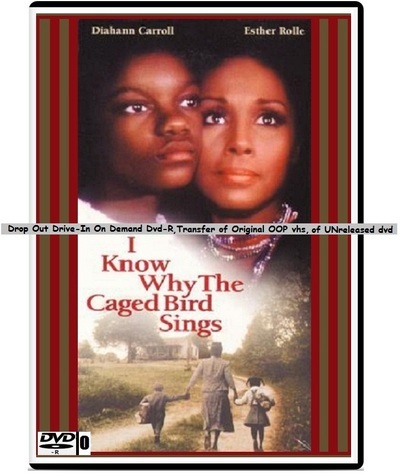 "I Know Why the Caged Bird Sings" (1979)(DVD-R) TRANSFER OF MY ORIGINAL, LONG OUT OF PRINT VHS OF WONDERFUL TRUE STORY TV MOVIE BASED ON LIFE & BOOK OF AUTHOR MAYA ANGELOU IN ARTCASE W/FREE U.S. SHIPPING INCLUDING DELIVERY CONFIRMATION! AND IF DIAHANN CARROLL OR MAYA ANGELOU FAN CHECK MY ADS FOR ANOTHER TvM ALSO LISTED AS WELL AS AN AD OFFERING THEM TOGETHER! John Driver ... Bailey Jr.
Roger E. Mosley - Bailey Sr.
TO PLACE AN ORDER: This site does NOT supply a button to click on to choose to buy, and I do NOT send out personal invoices, but sending payment via PayPal is easy! 2) I offer a $2 discount if prefer to order your movie as a plain/caseless dvd-r instead of in a slimcase w/artwork insert as I usually send. May take $2 off regular, w/ArtCase price when send payment if prefer to order as caseless/plain dvd-r but THIS OFFER IS NOT RETRO-ACTIVE, IF WANT CASELESS/PLAIN DVD-R PRICE MUST SEND THAT AMOUNT WHEN ORDERING.